The Oak Barn is a traditional style restaurant with English fayre, just a fifteen minute drive out of Brighton in the countryside of Burgess Hill. It’s situated next to a nine hole golf course if you fancy a game after eating here. The building is a beautiful 250 year old authentic barn with original features and furnishings. We arrived on a rainy afternoon, which really made this feel like the perfect place to be on such a winterly summer’s day (good old UK weather). 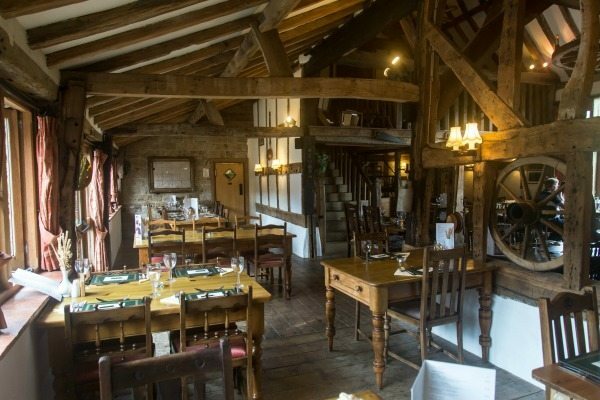 As soon as I walked through the doors of the Oak Barn it was so cosy, warm and inviting. The food matches that too, with plenty to choose from their menu which was classically English with a twist of contemporary. There was a relaxed ambiance with some background music and quite a few people out for lunch, and had it been a nicer day there was a fantastic garden we could have sat in. They source their food and drink locally where possible so we ordered a pint of Harvey’s to accompany our soon to be epic meal! 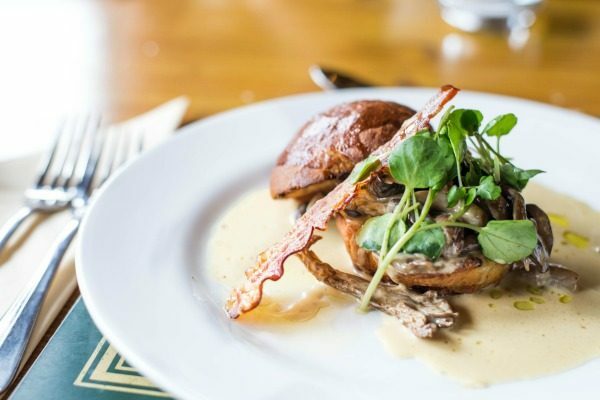 I decided to start with the Brioche & Wild Mushrooms which were cooked in a creamy Pinot Grigio & tarragon sauce served on a toasted brioche bun & a pancetta crisp (which was optional). My lunch buddy, Dan decided to start with the Oak Smoked Salmon & Shellfish Cocktail which was served on a bed of lemon dressed crisp baby gem lettuce, tossed in a thousand island dressing with pickled cucumber & rye bread. When we received the food from our friendly waiter we couldn’t wait to tuck in. 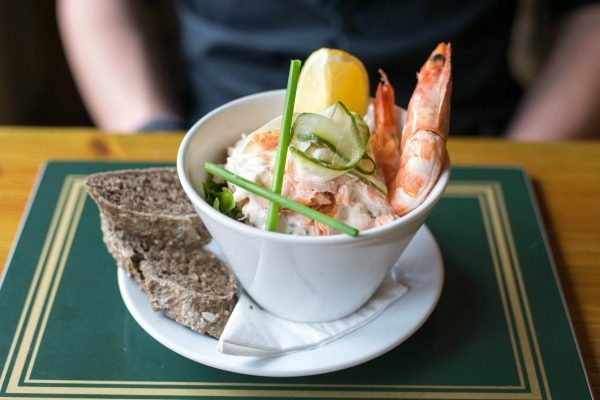 The smoked salmon cocktail looked especially like a showstopper with its giant fresh prawn. It was a fresh dish that wasn’t shy with its salmon serving that was perfect with the rye bread it came with. I was pretty pleased with my brioche mushrooms too; it was presented like an open burger with the wild mushrooms spilling out of the sweet toasted brioche bun. There was a fantastic selection of wild mushrooms that satisfied all textures and the sauce was rich, creamy and it liberally coated the mushrooms. The portion sizes would have been sufficient enough to have as a light lunch, which I was told many people like to do with the starters at The Oak Barn. Then came our mains. 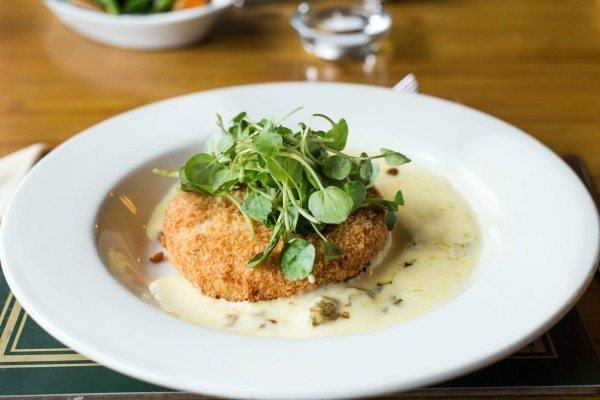 I had decided to try their vegetarian option of Sussex Goats Cheese & Chive Risotto Cake served with a Mornay Sauce, golden sultanas, roasted pine nuts & a side of seasonal vegetables. The sauce was delicious and I loved the pop of sultanas you’d get every now and then and a bite of pine nut, and the risotto cake had a good crisp to it. 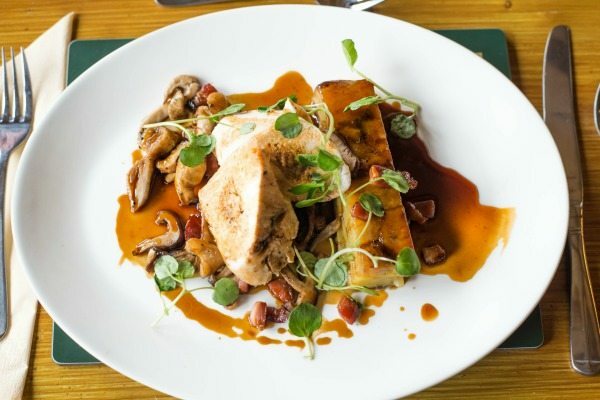 But the winner of the mains had to be Dan’s choice of Stuffed Free Range Chicken which had been stuffed with a wild mushroom & truffle mousse, bacon lardons, silver skin onions, dauphinoise potato, truffle sauce & a side of seasonal vegetables! There were so many different elements to the dish you never felt like you were eating the same thing, each forkful could be layered up with varying flavours. There was a lot of technical skill behind each element of the dish too. It reminded me of something I might see on Masterchef when it came out! The chicken, Dan said, had to be the best piece of chicken he’s eaten, and I could see where he was coming from when I gave it a taste; mouthwatering, tender and packed full of flavour. The mushrooms were meaty with a deep flavoured sweet dark sauce that had been paired with salty bacon lardons. It was a perfect match. The buttery dauphinoise potatoes were carefully layered and cut into a generous slice and were soft and succulent all the way through. Each component of this dish had been executed with obvious knowledge. I could have just taken the dauphinoise with some seasonal vegetables and be satisfied, it was that tasty! 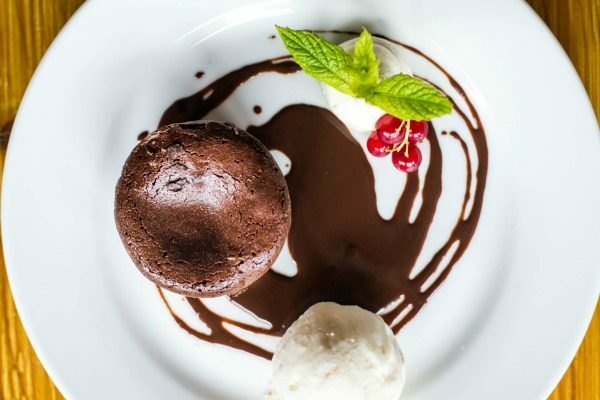 We finished by sharing a dessert and probably went for the most rich one on the menu; Double Chocolate Fondant, a warm dark chocolate sponge filled with melted white chocolate, served with chocolate sauce and honeycomb ice cream. The hot white chocolate sauce oozed out of the fondant when you stuck your spoon in and mixed with the honeycomb ice cream (topped with a redcurrant) it was a good balance of hot & cold and sweet & tart. It was presented beautifully on a plate with a squiggle of chocolate sauce which looked very artistic. It was definitely a pudding to share, especially after the portion sizes of our other courses. I could see why our waiter had said to us when we arrived that so many people say they go for a walk after they’ve finished eating at The Oak Barn!